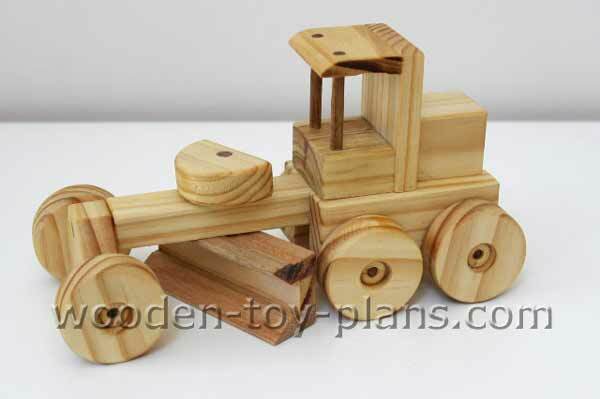 Woodworkers with a passion for making wooden construction toys will love these chunky model toys. Designed and built to last, these wooden toys make the perfect "made with love" gift for children. 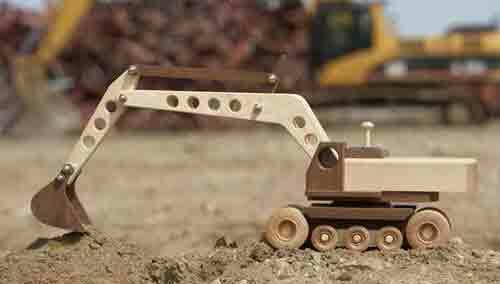 Make this delightful toy grader with this free plan, complete with step by step instructions, diagrams and photos. There is just enough detail to stimulate the imagination of children and adults alike. 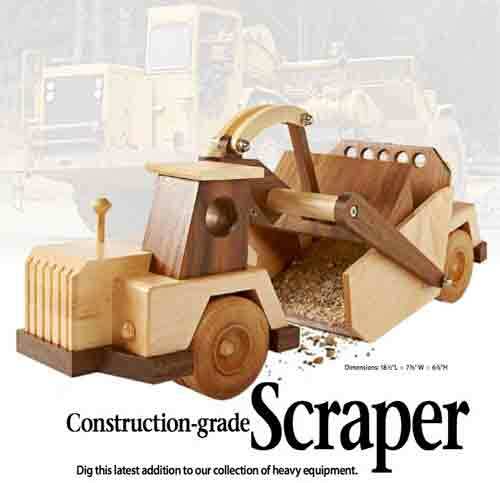 This construction toy can be made with just a few tools. A cordless drill is a tool that I use most often and as a bonus, it also useful for driving screws for carpentry work. Hacksaw to cut the dowel axles to length. A 12 inch disc sander or linisher with sanding disk attachment is very useful for trimming up end grain and squaring off small pieces of wood. 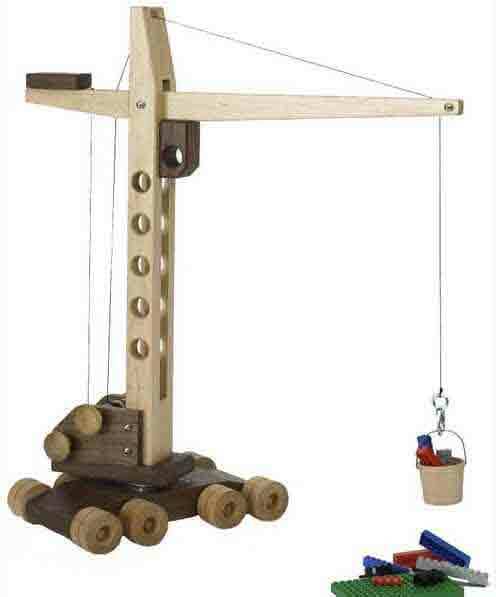 If you are going to make your own wheels for this wooden construction toy, a drill press is recommended. You will also need a 16mm spade bit, a 6mm drill bit and a circle cutter modified to cut wheels instead of holes. 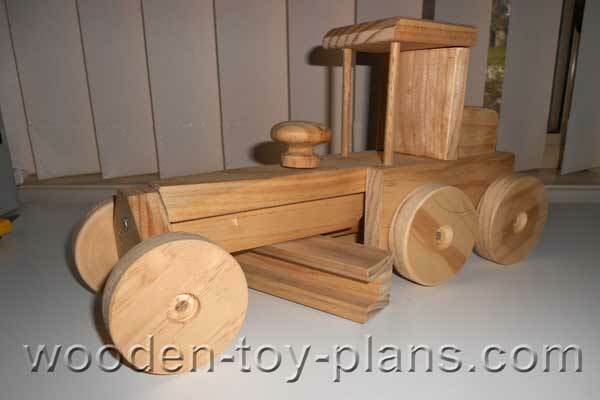 This wooden construction toy can be made with bits of wood left over from other projects. I made mine from a piece of left over pine 19mm thick by 140mm wide by 500mm long. The wheels were also cut out of 19mm pine by 140mm wide. For the six wheels, I used a piece less than 200mm in length, and the extra length was useful in clamping the piece while using the circle cutter. The blade of the grader was made with a piece of skirting board 200mm long. For the axles, use 6mm dowel. 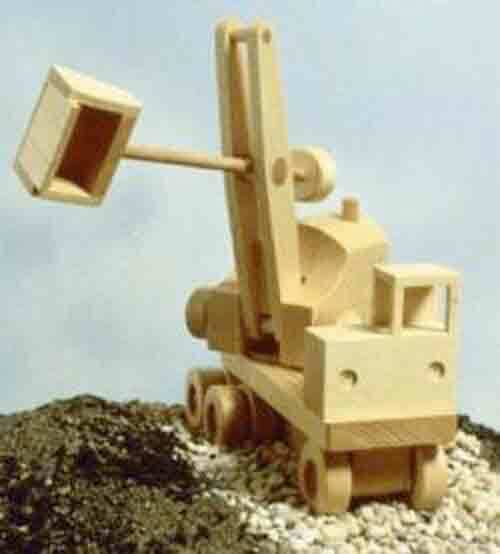 Download a print ready PDF copy of the construction toy plans. Step 1. The first step is to read through the instructions and study the plans and photos. Step 2. Using a soft pencil and a ruler, mark out the component parts as shown in the drawing. 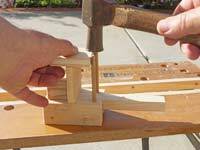 Cut out the parts using an electric jigsaw, a backsaw or a scroll saw. Parts A to D are trimmed back to their proper sizes. A twelve inch disc sander is useful for trimming small pieces. Glue the pieces that make up parts E and F and put to one side to set. Clamp parts B together and drill the holes for the axles. At this stage, the holes are drilled for a snug fit. Do this in order to make sure things stay lined up when the parts are glued and clamped together. Dry clamp parts A and B together, keeping the two parts B aligned with the axle dowels. Mark the pieces so that it will be re-assembled in the correct order. It is shown in red in the photo only to highlight the idea, so don't actually mark it in red. Apply the glue, clamp it and put to one side. It is important that the axle dowels are left in place until the glue sets to minimize creep under clamping pressure. Once the glue has set, re-drill the holes to allow the axles to spin freely. The blade of the grader, part C, is made from a piece of skirting board cut to a width of 30mm. It may also be made from a piece of timber that is 9mm thick, just chamfer one edge to the profile shown in the drawing. 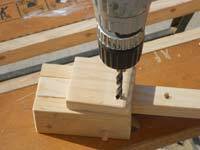 Cut and trim part D to size, and drill the axle hole using a drill press or drill guide. Use the 6.5mm drill bit to allow the axle to spin freely. Drill the holes for the roof of the cab by placing it on the body as shown in the photo. The photo shows how to fix the dowels on place by measuring the height the dowels are set so that they sit slightly above the roof. This is an idea borrowed from the Craftsman furniture movement. Glue the roof and engine block in place. Once the glue has set, lightly sand the whole toy with 220 grit sandpaper, removing all the sharp corners. Attach the wheels with a small dab of glue. Leave it in it's natural state, or apply your favourite finish. I used yellow food colouring for a bright yellow finish. To make the wheels black, I mixed all the food colours together. For information on food safe finishes and dyes, visit U-Beaut.com.au includes links to international suppliers. Construction toy plans easy build steam roller. Large toy road grader, about 20% bigger than the original version of the road grader. 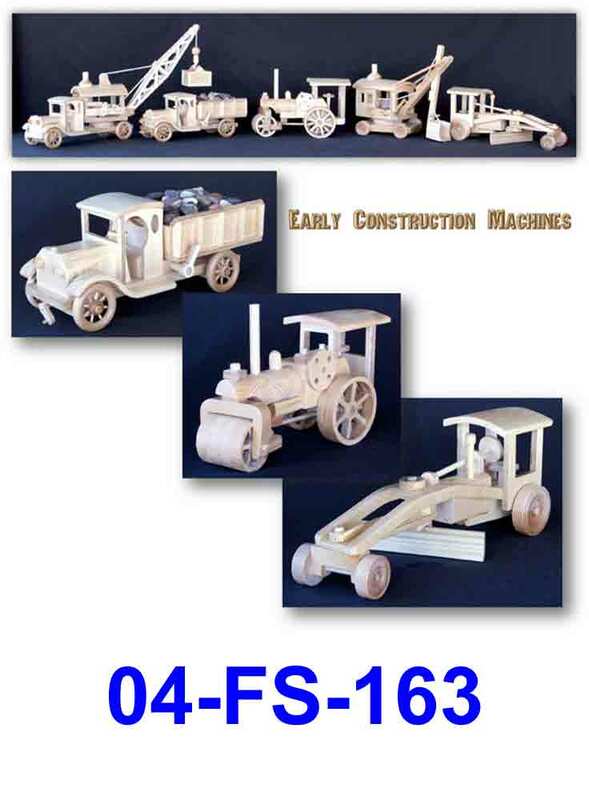 Wooden models of early construction machines. Search for the plan code 04-FS-163. In real life, these massive machines shake the ground we walk on. The earth will also shake from the jumping of joy that the recipient will do when they receive one as a gift. Engine rated at 1 kidpower, continuous duty! Put this toy and a pile of marbles or Legos in front of children and watch them while away the time scooping and moving them. Hand-operated hoists raise and lower the boom and bucket. The tower assembly pivots smoothly on a ball-bearing lazy Susan to easily pick up and place loads. A wide-track chassis featuring eight sets of dual wheels provides sure-footed mobility. 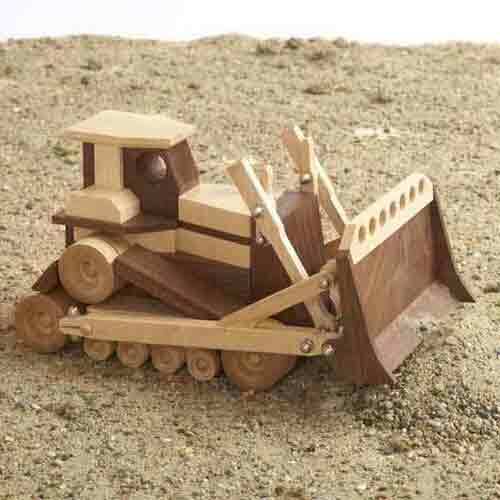 For simply pushing blocks around a playroom, or gathering compliments about your woodworking, this dozer gets the job done. As it lumbers across the job site, its operator can lift and lower the blade just like on the real thing. Sandbox construction crews will find plenty of on-site jobs for this heavy-duty equipment replica. With its workable boom and bucket assembly, this model works just like the real McCoy. Your little foreman can actually dig, hoist and dump mini-mountains of sand all afternoon, and love every minute of it. 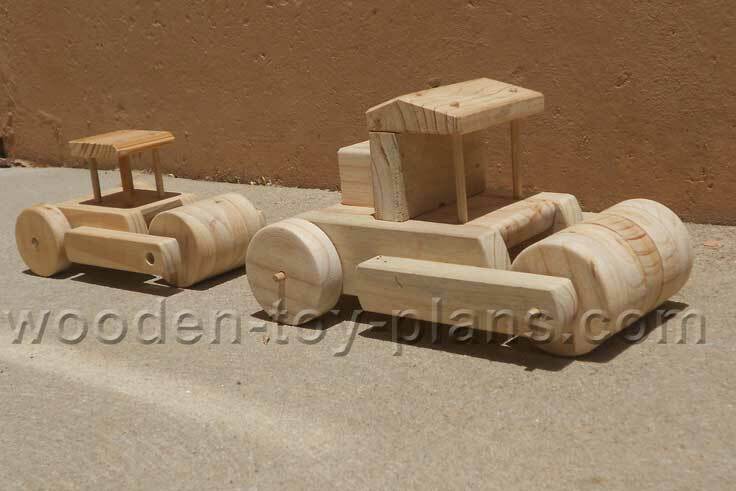 More free wooden toy plans includes tipper trucks, airplanes, cars even a batmobile.